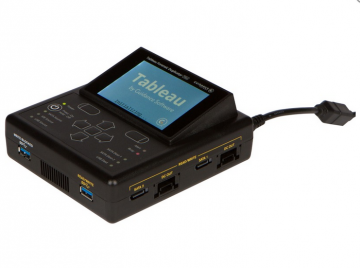 Tableau TD2u Forensic Duplicator (imager) is the ideal combination of easy operation, reliability, and ultra-fast forensic imaging performance. From the outside, TD2u looks similar to its predecessor model, the award-winning TD2. From the inside out TD2u is all new. Built with the most advanced technology, TD2u delivers high performance forensic features at a budget friendly price. Forensic Imaging Support for USB 3.0, SATA, IDE, and SAS Forensic examiners rely on TD2u to image SuperSpeed USB 3.0, SATA, IDE, and SAS storage devices. Using the very latest in solid-state SATA drives, TD2u images in excess of 15 GB/minute (.e01, compressed with MD5 and SHA-1 hashing). Wiping speeds exceed 25 GB/min. TD2u makes one (1:1), two (1:2), or even three (1:3) copies of evidence drives. Standard features include Disk-to-Disk (clone), Disk-to-File (image), Format, Wipe, Hash (MD5 and SHA-1), HPA/DCO detection and removal, and Blank Disk Check. TD2u outputs to raw (dd), .e01 (compressed), .ex01 (compressed), and .dmg (MAC) formats. Extensive log files are maintained for viewing and saving.